Welcome to Chut HaM'shulash (NTCF)! 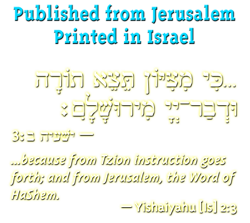 The Nehemiah Threefold Cord Foundation (NTCF), or "Chut HaM'shulash" in Hebrew (Threefold Cord) was launched to build-up the community of Talmidei-Torah [students of the Torah] in the Land of Israel, and throughout the world. "Chut HaM'shulash" in Hebrew, is taken from the text of Kohelet [Eccl] 4:12, in which the narrator states that "one who attacks may defeat a loner, but two can resist him; and a three-stranded cord is not easily broken." Chut HaM'shulash provides online opportunities to gather and learn from the Torah, through the vehicle of educational Torah-centered lectures, that should assist participants to align themselves with the goals and vision of the G-d of Israel [Ha'Shem], AHM [the nation and people of] Israel and the Land of Israel, in our generation. Our overall objective is to present the ongoing story of Israel's history and her future, which includes presenting the foundational belief in a coming Mashiach, first and foremost for AHM Israel, and then for the nations, in a manner that does not contradict the Torah or Judaism's messianic expectations. Our Sages taught that “Whosoever saves a single soul of Israel, Scripture ascribes [or merits] to him as though he had saved an entire world” [Talmud Bavli, Masechet Sanhedrin 37a]. Many in our generation are finally beginning to understand that the Jewish identities of the founding personalities of the christian religion were all hijacked, and then their teachings were all altered with surgical precision in order to conform with anti-semitic doctrines that the early gentile church fathers believed they needed in order to survive. In and through our classroom studies, and in light of Yermiyahu 16:19, we seek to return and restore the identity and teachings of these Jewish souls who never authorized unscrupulous gentiles to hijack their writings and create from them a new nefarious religion saturated with lies. Their corruptions, transmitted to future generations after tampering with and altering the original written testimonies, effectively replaced our Torah’s teachings and ideas, concepts and doctrines that were never found in or supported by Torat-Moshe. By translating the earliest NT Greek MSS available, never before translated into English by Jews living in Jerusalem, historic messages emerge that are entirely consistent with Torat-Moshe, the Holy Prophets of Israel and with the thirteen principles of the Jewish faith, which enables readers to resist and distance themselves from the lies of their fathers. We look forward to any opportunities to help you better connect to our Land, our People, our G-d and our Torah. Enjoy your visit to our site. is the story of one Jew’s journey after he dared to challenge non-negotiable Christian / Messianic doctrines, and questioned their heavily guarded traditional dogma, with the Hebrew Language at his side. Over the centuries, the question of Yeshua’s (Jesus’) identity has intrigued and challenged many. There has never been a shortage of controversy on the subject. "IF" enables the reader to dig beneath classic poorly translated Biblical texts that have been relied upon for centuries to support wholly incompatible foreign concepts, which neither Moshe (Moses) nor the Jewish Prophets ever knew anything about. 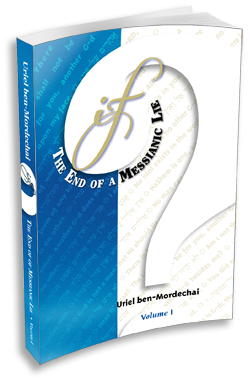 Using the Hebrew language and its grammatical structure, Uriel ben-Mordechai dispels the Christian and Messianic movement’s myth that could not succeed to pull the wool over Jewish eyes, in connection with the historic personality of Yeshua. If you want to rediscover a Jewish Yeshua, this book is a must-read! © 2011 Chut HaM'shulash. All rights reserved.